How much has changed since 1934? 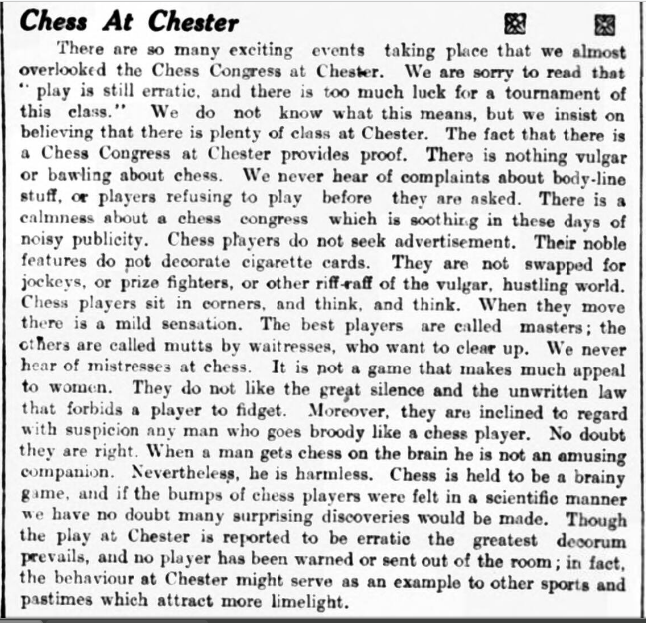 Several Chester players attended the revived Crewe Chess Congress, now in it’s third year, at Ibis Styles Hotel between 12th and 14th October. There were a record 141 entries as described in the report on Crewe’s website here. In the Open, Chris Doran scored 3 out of 5 including a good win against 199 rated Mike Surtees. Colm Buckley unfortunately didn’t have a good time, scoring only two draws and a full point bye. I played in the Major Section. A draw that I should have won was followed by a draw that I should have lost. A win in round 3 put me in contention, but this was ended after defeat in round 4. I won my final game, so I scored 3 out of 5, which was enough for the grading prize (a feat I achieved last year). 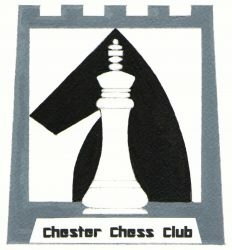 Also involved was part time club member David Hulme, now officially of Crewe Chess Club. David was playing in his first tournament in quite some time and should be pleased with his 50% score. The Intermediate section was won by our own Joe Nemcek. His half point bye in round 1 was followed by 4 straight wins. Finishing equal fourth was young Jack Yang who scored 3.5 points whilst his father Jixin could unfortunately only manage 2 points. Due to computer pairings the two met in round 1, with Jack being victorious on this occasion.